More than two-thirds of the world population of Northern Gannet breeds around the coasts of Britain and Ireland. Plastic is being found in an increasing number of nests (Oliver Smart). Each year, with collaborators from Australia, I make my annual trip to an island which some describe as paradise, with white sandy beaches, unbleached corals, waving palm trees – and a dark underground secret. 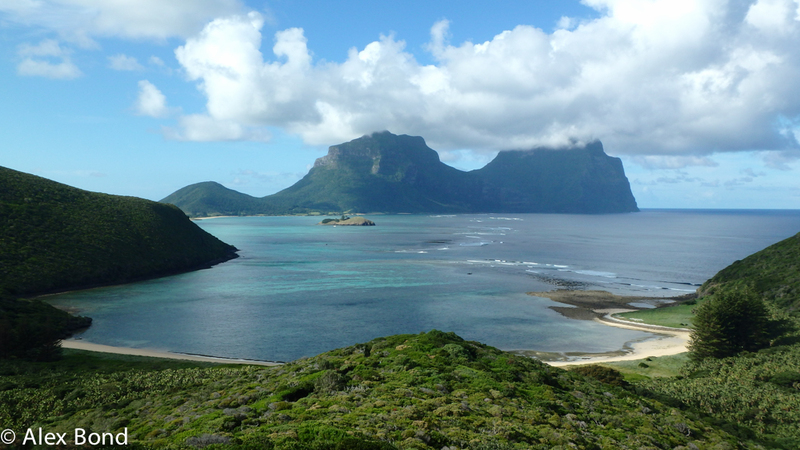 In the middle of the Tasman Sea between Australia and New Zealand, Lord Howe Island is home to about 350 people and has a thriving tourist economy, with daily flights from the Australian mainland. It’s also home to thousands of seabirds – shearwaters, petrels, terns, boobies, and more – because until human arrival in the 1780s, the island was free of terrestrial mammals, making it an ideal place for seabirds to raise their chicks. The island holds the world’s largest breeding colony of Flesh-footed Shearwaters, a large greyish-brown bird with pinkish legs and a black-tipped bill. But a combination of bycatch in fisheries and light attraction on the island meant the population wasn’t faring so well. It was while trying to understand these pressures that a relatively new one reared its ugly head: plastics. 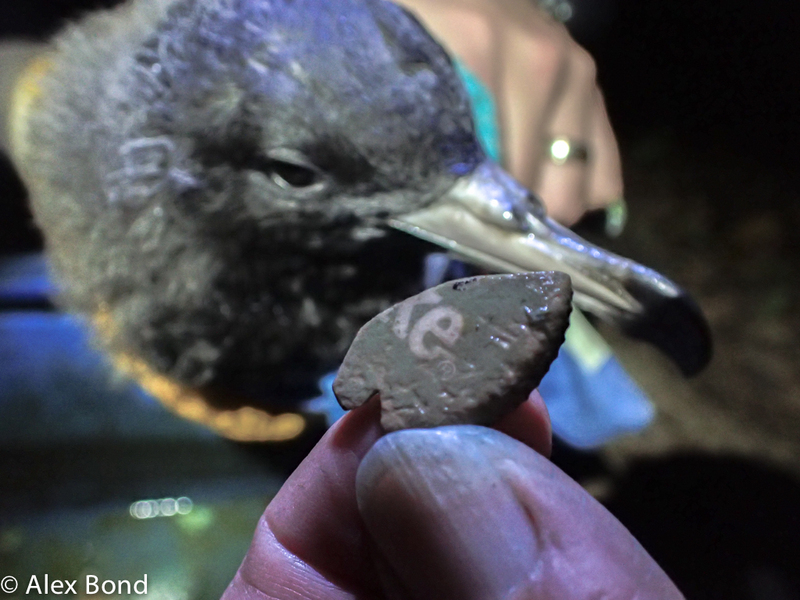 The Flesh-footed Shearwaters (top) of Lord Howe Island (bottom) in the Tasman Sea are ingesting plastic waste from around the world, sometimes up to hundreds of pieces (Alex Bond). These polymers, composed mainly of hydrocarbons, were first developed in the mid-1800s as an alternate material to ivory for billiard balls. Now they comprise many different types: polyethylene, silicones, polyesters and more, with each corresponding to one of the numbers 1-7 that we see in the recycle symbol (with 7 being a catch-all for anything not numbered 1 to 6). Production really took off in the 1950s, and now more than 300 million tonnes of new plastics are made every year. But unlike many of the materials they replaced, plastics don’t disappear or break down – they only break up into ever smaller pieces. Of the billions of tonnes of plastic produced in the last 70 years, well over 95 per cent of it still exists somewhere in the world. But what does this mean for birds? 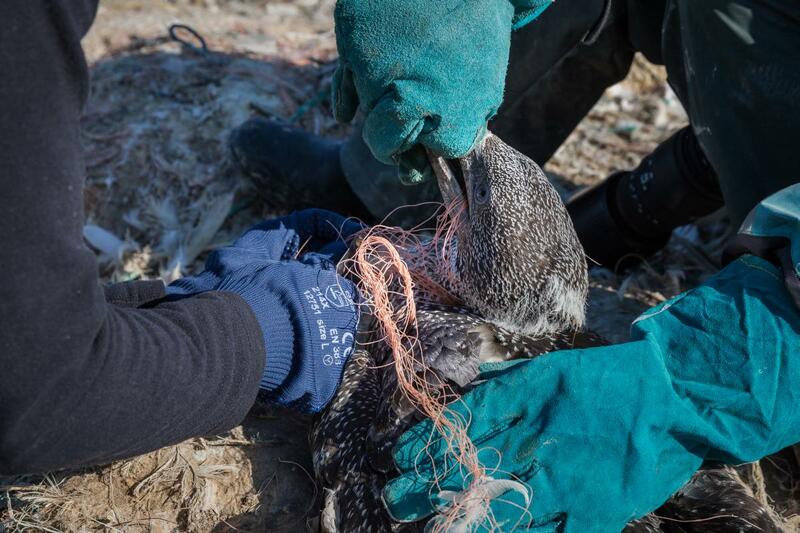 Birds can experience two main impacts from plastic pollution: entanglement and ingestion. The former is the less well-documented of the two, but is often the more lethal. Birds can become tangled in abandoned fishing nets (‘ghost nets’) at sea, and species that build nests, such as gannets, boobies, gulls and albatrosses, often mistake it for natural materials like seaweed and actively collect it to incorporate it into their nest structure. 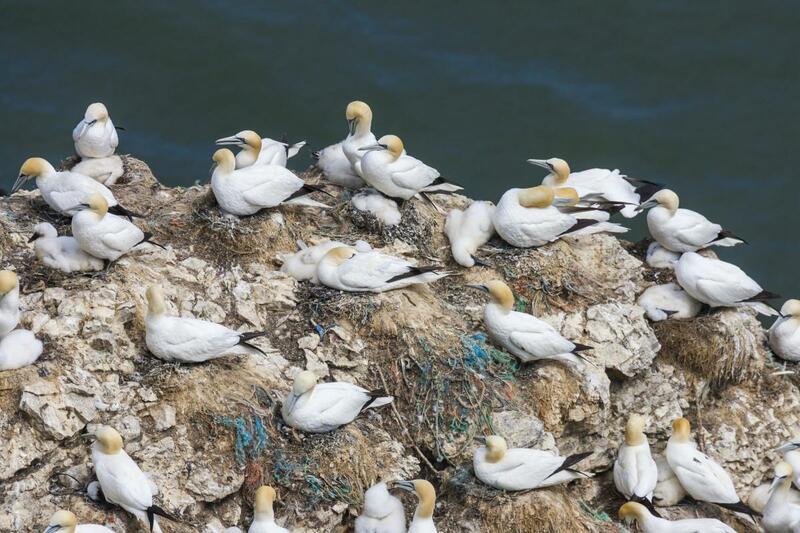 In Britain, this is most visible at Northern Gannet colonies, and in particular at Grassholm in south Wales, where plastic debris, usually ropes or nets, is found in practically every nest and cumulatively weighs almost 20 tonnes. Each year, wardens, researchers and volunteers go out to cut lose any birds they can, averaging more than 60 a year. So far this hasn’t affected the population, but the fact remains that at gannetries across the Atlantic, these birds’ deaths are preventable. The gannetry at Bempton Cliffs, East Yorkshire, is blighted with plastic pollution as the birds incorporate it into their nests (Oliver Smart). On Lord Howe Island, the threat isn’t from shearwaters becoming entangled in fishing debris, but rather from ingesting pieces of plastic. For 80-90 days, the chicks remain in their 3-m-long sandy burrows as their parents bring food back from the Tasman Sea. When all goes well, the chicks will weigh nearly 900 grams, almost 20 per cent more than the adults. But increasingly, the chicks’ meals have become a toxic soup. Some years, every chick is fed at least some plastic; we can examine this when the chicks emerge from their burrows at the end of the breeding season by flushing their stomachs gently with water so that they regurgitate the plastic that has accumulated inside them. Alongside the sort of things you might expect (fish bones, hard parts from squid and the odd feather), we also find bottle tops, ballpoint pen caps, clips from helium balloons, glow sticks from squid fisheries and countless other unidentifiable items. The birds that have more plastic in them have less room for nutritious food, and sadly starve to death with their stomachs full. 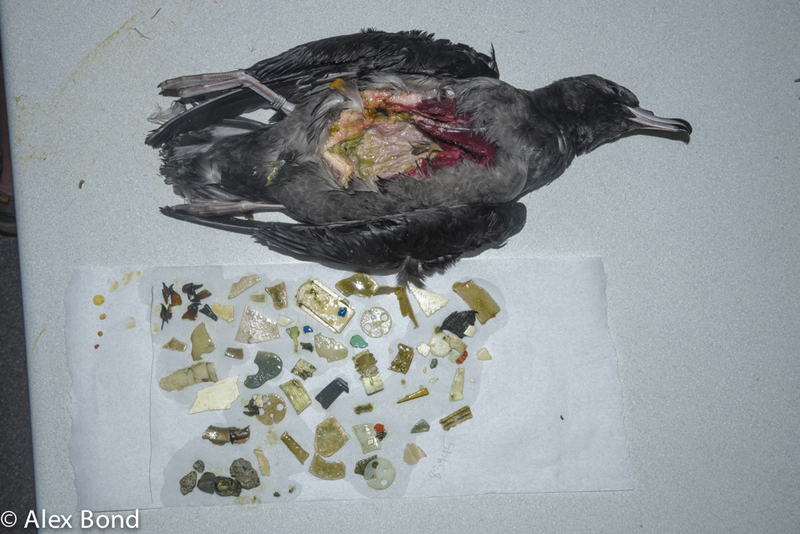 In one single bird, we counted 276 pieces of plastic weighing 64 g. That’s the equivalent of about 12 kg for a human. These chicks often weigh just 400, 300 or even 200 g and face grim prospects for survival. We often find birds on the beach, having tried to fledge the night before, but unable to make it past the waves because they are too weak to fly. Some have already been scavenged by ghost crabs, while others cling onto life. The birds in better condition stand a chance – we can flush their stomachs, feed them a squid smoothie and release them the following night. Most are too far gone and don’t survive the day, but even those that do make it are already playing catch-up – they often weigh less and have shorter wings than birds without plastic, which makes their migration to the Sea of Japan that much more challenging. Even when birds only have a few pieces of plastic, each of those fragments can be an individual toxic bullet. Plastics act like sponges for contaminants in the ocean, sopping up persistent organic pollutants and metals which can be transferred to birds when the plastic is ingested. Figuring how much contamination comes from the plastics rather than from prey isn’t straightforward, but the case of polybrominated compounds provides a useful example. Polybrominated diphenyl ethers (PBDEs) are a group of compounds usually used as flame retardants and found in a wide array of household and commercial goods, including electronics, furniture, building materials and textiles. When scientists looked at the different congeners (the different kinds of PBDEs) in Short-tailed Shearwaters, they noticed that some were common between the birds and prey, which makes sense. But a new and troubling discovery was that some congeners in the birds were completely absent from the fish and squid they ate, and could have only come from one source, where it was quite common: plastics. So what do we know about seabirds and plastic in Britain? Surprisingly little. When we reviewed the state of knowledge around plastics and seabirds across the eastern North Atlantic, we found that we knew less than we thought, and much of our information was outdated or likely not representative. Of the 79 seabirds and seaducks that occur regularly in Britain, there are no data on plastic ingestion, entanglement or nest incorporation for 48 of them (a whopping 61 per cent). Nine others have single reports from one site in one year, and only nine have information from multiple sites in multiple years. But even this is overly optimistic, as in many cases the sampling is 20 or 30 years old and plastic production has been increasing exponentially since the 1950s – can these data still be reliable in the face of such increasing pressures? 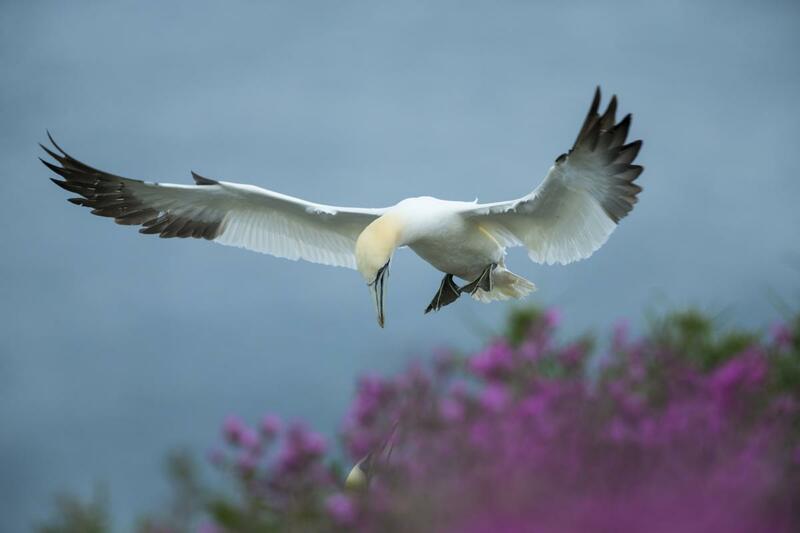 At the Northern Gannet breeding colony on Grassholm Island, Pembrokeshire, volunteers head out every summer to release birds tangled in discarded rope and netting (Drew Buckley). Some species, such as Manx Shearwater, are iconic British seabirds, and yet the data we have is from 1983-1985, and consists of just over 10 individuals. What’s more, the data reported is often missing some key information, including the sample size or how many individuals contained plastic, and 95 per cent of studies don’t report data on plastic mass, which is arguably more important than presence or absence or the number of pieces – a small bit of film plastic has a different impact than a whole bottle cap, for example. Tackling such a pervasive problem as plastic pollution isn’t easy. The very properties that fuelled the rise in plastic use – its malleability, durability and light weight relative to other materials – are exactly the traits that make it difficult to manage. Because most plastics float, once they get into the ocean they can circle the globe. In 1992, a dozen containers were washed off a cargo ship in the North Pacific. Inside were tens of thousands of rubber ducks and other plastic bath toys. Over the next two decades, they washed up on beaches around the world, reaching Britain in 2003. For the last 20 years, pieces of Lego have been washing up on the beaches of Cornwall and Devon from a container that went overboard in 1997. On Henderson Island, the most polluted uninhabited remote island in the world and part of the Pitcairn Islands in the South Pacific Ocean, we found identifiable plastic on the beach from as far away as Spain and Scotland. With 80 per cent of marine plastic debris coming from land-based sources, mainly gaps in waste management systems, addressing it requires a global effort not unlike climate change. International environmental policy moves slowly, but compared to climate change, plastic pollution is at least 30 years behind – there is only acknowledgement that the problem exists. And we all know how much more work there is to do around climate change and the international community. There are no concrete strategies or targets (voluntary or binding), only vague commitments and a problem that shows no signs of slowing down. Some Flesh-footed Shearwaters can be saved by flushing their stomachs so they regurgitate the plastic (Alex Bond). Ultimately, change will come from two directions – from individuals making differences in their own lives, pushing companies and governments to do more, and from the international community coming together to tackle this global problem. On a personal level, there are some simple low-cost ways we can reduce our plastic consumption. First, we can bring our own reusable items, like canvas bags for produce rather than plastic bags at the supermarket, and using refillable water bottles rather than buying a single-use plastic one. Second, we can look for plastic-free alternatives such as soap bars rather than bottled shower gel, or use bamboo toothbrushes rather than plastic ones. And third, when plastic isn’t avoidable, make sure it gets recycled properly. Only about 10 per cent of plastics in Britain get recycled (it’s a similar figure in the US, Canada and Australia). Find out what your local waste management provider accepts, and see if there are other avenues such as community drop-offs or services through your workplace for anything that isn’t accepted. We can also push companies to reduce the amount of plastic in their packaging through direct lobbying and the choices we make by opting for plastic-free or reduced plastic products. One voice may not be heard, but many together will be harder to ignore. This is an international issue, so we also need to push governments and regulators to demand reductions in plastic, and to implement national policies aimed at reducing the amount of plastic pollution that enters our seas. The next time someone running for election comes to your door, ask how they plan to tackle this issue. It’s only through international co-operation that we can truly make a dent in marine plastic waste. There have been great strides in the last few years, including a ban on microbeads in cosmetic products in Britain, and discussions around container deposit legislation. Public awareness of the issue has never been greater thanks to TV shows such as Blue Planet 2 and Drowning in Plastic that aired in 2018. The time is right for making some serious headway. We still have much work to do. The shearwaters of Lord Howe Island depend on it. What are you doing to reduce your plastic use? Share your best tips by emailing us at editorial@birdwatch.co.uk, or on Twitter using the hashtag #GoPlasticFree and don’t forget to tag @BirdwatchExtra.